It is quite probable that every Victorian Industrial town had a Gas Street. Coal gas was a fairly efficient fuel that could be easily adapted for domestic and industrial use for heating and lighting. Gas Street was on the south side of the first engine shed, with a terrace of eight houses and the gas works itself. 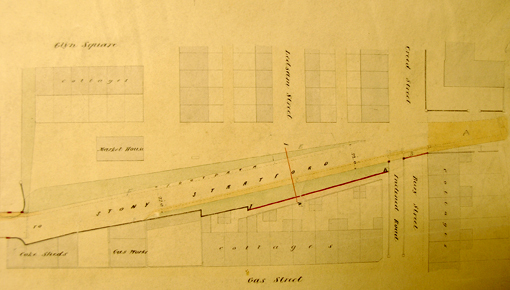 This drawing from 1845 illustrates the plan. The original site was so small that there was no room for expansion. 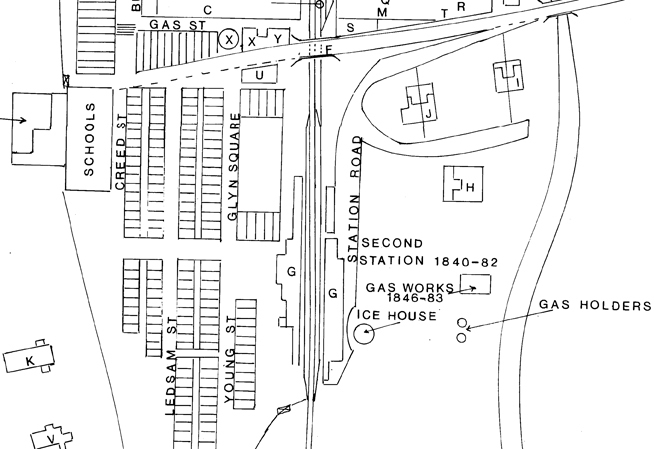 In any case workshop expansion was taking priority, so the Gas Works was moved to the south east, near to the second station. This plan drawn by Bill West shows the location. The next move came when they built the new loop line and closed the second station in 1882. The Gas Works were moved to the Old Wolverton Road, nested between the two embankments. It was operated on behalf of the works and the town by the L&NWR and after 1924 by the LMS. In 1948 all gas production was nationalized and placed under the control of the East Midlands Gas Board. I am not sure exactly when it closed but the discovery of natural gas probably ended its useful life. I have written a post about this Gas Works here. The Wolverton Gas Works was nestled in between the two railway lines on the Old Wolverton Road. This photograph, taken before 1950 shows the gasometer and part of the plant on the right. On the left was a railway siding which took coal wagons down to the works. Although gas works of this type were common enough in larger towns in the first part of the 20th century it says something for the self-contained economy of Wolverton that this Gas Works was owned and operated by the railway company. Gas originally supplied fuel for lighting and cooking, but electricity replaced gas for lighting as a cleaner and safer alternative. As a boy I can recall one surviving gas street light outside the Wesleyan Chapel on Church Street and several houses still had lighting spigots embedded in the walls. One of my grandfathers entered the fledgling gas industry after leaving Technical School with Birmingham Corporation. Then he went to work for the GWR as a gas lighting engineer and was subsequently “poached” by the L&NWR to set up a testing laboratory at Euston. In 1930 he came to Wolverton as manager of this gas works, and stayed there until his retirement in 1952. He remained a railway employee through the LMS period and British Railways after 1948. At the same time Gas production and distribution was nationalized and the East Midlands Gas Board came into being and took over the distribution of gas – I assume through some arrangement with the railways.